SUBHEAD: In April judge ruled Navy training in Pacific violates laws meant to protect marine life. 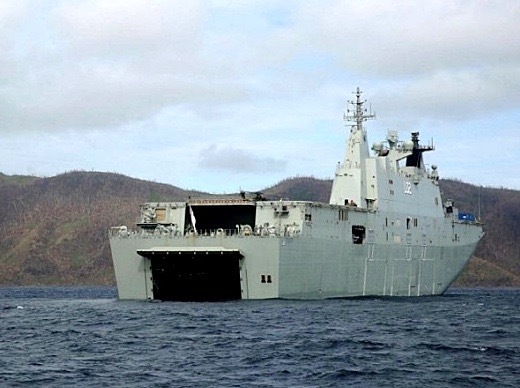 Image above: The Royal Australian Navy's first-of-class amphibious assault ship Canberra, during its March 2016 mission in Fiji will participate in Hawaii for RIMPAC 2016 exercise with integration USN's MV-22 Osprey, CH-53 Sea Stallion helicopter operations. From (http://www.janes.com/article/59239/ran-to-integrate-usn-s-mv-22-osprey-ch-53-sea-stallion-on-board-hmas-canberra-at-rimpac-2016). “The court is saying that the Navy’s categorical and sweeping statements, which allow for no compromise at all as to space, time, species, or condition, do not constitute the ‘hard look’ required by NEPA,” Mollway wrote regarding the Navy’s stance that restrictions would hinder military practices. Henkin said the Navy has access to 3.5 million square miles of the waters sweeping from California to Hawaii. Some select areas are particularly sensitive for sea life, such as whales. For example, around 50,000 square miles off Hawaiian waters could be classified as sensitive grounds for marine life, and that size can be avoided while leaving plenty of sea for military operations. Held every two years and hosted by the U.S. Pacific Fleet, Rim of the Pacific, or RIMPAC, is the world’s largest international maritime war exercise. In total, 22 nations, 49 surface ships, six submarines, more than 200 aircraft and 25,000 personnel participated in last year’s event from June 26 to Aug. 1. It included live fire target practice, explosives, sonar and the sinking of the decommissioned USS Tuscaloosa 57 nautical miles northwest of Kauai. One of those citizens is Hanalei resident and marine biologist Terry Lilley. He copied U.S. Congresswoman Tulsi Gabbard on dozens of emails and photos over the last year documenting what he says shows the serious damage being caused to Kauai’s nearshore marine environment, including green sea turtles, sharks, reefs and coral, by the Navy’s activities. SUBHEAD: Navy says military exercises not harmful to marine life, but others disagree. The U.S. Pacific Fleet in Pearl Harbor says community concerns that the Rim of the Pacific maritime exercise and Kauai’s Pacific Missile Range Facility are negatively impacting marine life are unfounded. In early October, after hearing from several constituents, Hawaii Congresswoman Tulsi Gabbard requested information about the Navy’s efforts to monitor the effects of RIMPAC and PMRF on the ocean and marine ecosystems. “In response to concerns of your constituents, there has been no scientific evidence that RIMPAC 2014 or exercises at the Pacific Missile Range Facility (PMRF) have caused damage to marine life,” USPF Commander Adm. Harry B. Harris Jr. wrote in a response to Gabbard. In his three-page letter, Harris discussed the aggressive steps taken by the Navy to avoid harming marine mammals, sea turtles and corals, through the use of protective measures during training, especially with sonar and explosives. Harris also pointed out that the Navy funded over $300 million in independent research over the past 10 years, making it a world leader in marine mammal research and monitoring. “The Navy works with regulatory agencies, using the best available science, to obtain necessary authorizations and continues to further our understanding of marine mammals through research and monitoring,” he wrote. Others, however, say the military exercises are harming marine life. Katherine Muzik, a local marine biologist, said it is proven — as written about in Joshua Horwitz’s book “War of the Whales” — that sonar is lethal to whales. It is only logical, she said, that it would also have deleterious, if not lethal, effects on invertebrates, including shrimp and coral, which rely on vibrations for detecting prey, escaping predators and reproducing. Muzik said that with so many factors already damaging the marine environment — warming ocean temperatures, acidification and pollution — for the U.S. military to insist on purposefully, knowingly and deliberately maiming and killing marine life in the name of practice is unacceptable and tragic. In August 2013, a pair of environmental impact statements detailed that U.S. Navy training and testing activities could inadvertently kill hundreds of whales and dolphins — an injure thousands more — between 2014 and 2018. The studies included waters off the East Coast, the Gulf of Mexico, Southern California and Hawaii. Most of the deaths — as many as 155 off Hawaii and Southern California — would come from detonating underwater explosives, while some could be caused by sonar testing or animals being struck by ships. In addition to deaths, the EIS report said the activities off Hawaii and Southern California could cause 2,039 serious injuries, 1.86 million temporary injuries and 7.7 million instances of behavioral change. Held every two years and hosted by the Pacific Fleet, RIMPAC is the world’s largest international maritime war exercise. In total, 22 nations, 49 surface ships, six submarines, more than 200 aircraft and 25,000 personnel participated in this year’s event, which lasted from June 26 to Aug. 1 and included live fire target practice and the sinking of the decommissioned USS Tuscaloosa 57 nautical miles northwest of Kauai. The drills take place in the Hawaii Operating Area and several off-shore ranges, including PMRF. Harris told Gabbard there are steps the Navy must take to minimize harm to the environment — per environmental laws such as the Marine Mammal Protection Act and the Endangered Species Act — during its trainings, including RIMPAC. Before each RIMPAC, Harris wrote, the Navy briefs participating U.S. and foreign units about protective measures, as well as reminds service members to avoid interaction with sea turtles, Hawaiian monk seals, dolphins, coral reefs and Essential Fish Habitats. Additionally, Navy officials complete Marine Species Awareness Training and units are required to report sonar use and submit daily marine mammal sighting reports. Prior to and during training with sonar, the Navy uses trained, qualified lookouts to search the area for marine mammals, according to Harris. If one is sighted within 1,000 yards, sonar transmissions are reduced. Within 200 yards, sonar is shut down completely. “Safety zones are also established to protect marine life from the effects of explosive and non-explosive munitions,” he wrote. In an emailed statement Wednesday, Gabbard said she has been “deeply concerned about the scope of devastation” of Kauai’s coral reefs, which continue to suffer from an outbreak of black band coral disease. Over the past year, she said she has reached out to experts in marine biology, local and federal officials, and the U.S. military to ask about potential causes and how the disease can be stopped. Gordon LaBedz of the Surfrider Foundation Kauai Chapter, which sued the Navy over the 2006 RIMPAC exercises, described Harris’ response letter as “100 percent predictable,” and said he puts the Navy right up there will the commercial fishing industry in terms of the world’s most environmentally destructive entities. “In my 30 years of suing the Navy, I’ve never experienced them as good stewards of the environment,” he said. As for Harris’ comments about there being no evidence, LaBedz said it bothers him. When a whale dies, it sinks. It doesn’t float on the surface where it can be found, he said. In his letter, Harris also addressed a situation in July in which a 16-foot sub adult pilot whale washed ashore and died in Hanalei Bay. In response, the Navy conducted an aerial survey in accordance with the Pacific Fleet’s Stranding Response Plan. When asked how someone would obtain the scientific evidence referenced by Harris, and what that evidence might be, or look like, Pacific Fleet spokesman Mark Matsunaga wrote, “The Navy uses the best available science in its environmental analysis and lists these references at the end of each resource section of our EISs,” and referred TGI to a series of websites, including www.hstteis.com.